Forum Index > Off-topic Talk > Medieval Battles: Deep multiple battle formation? 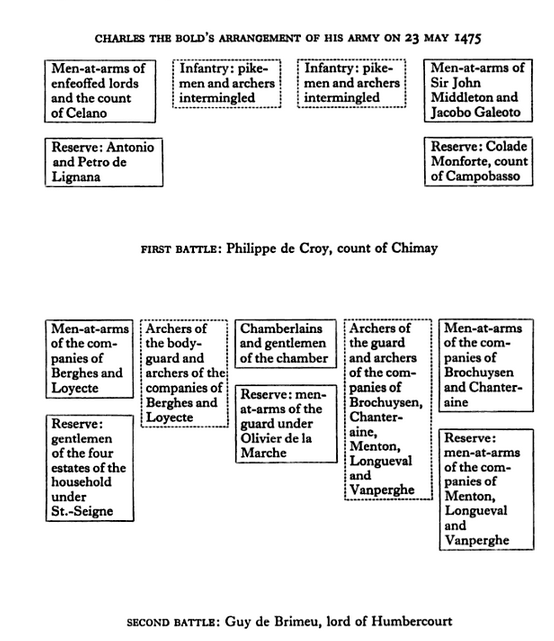 Posted: Wed 07 Oct, 2015 12:51 pm Post subject: Medieval Battles: Deep multiple battle formation? Hey there folks I got a little question regarding medieval battle formations. Maybe it's because of movies, video games or later historical battle that I always held the notion that armies were deployed in one or more lines across a battlefield, wider than it was deep. However recently I came across some text which suggests something else. I knew many medieval commanders divided their army into separate entities such as vanguard, mainguard and rearguard, and that sometimes separate entities of the army were called 'battles'. Of course the vanguard would be at the front of an army traveling and I read quite a few primary sources in which the vanguard engages an enemy position first while the rest of the army has to catch up. I read that in pitched battles these guard or battles as they were called were deployed in a more linear formation with the vanguard holding the left, mainguard the middle and the rearguard the right (or the other way around). I'd imagined this is something sensible to do as it allows your army to engage the most of its soldiers, protect it's flanks and overlap the enemies flanks. However in some pitched battle it almost appears as if these larger formation were deployed in a column formation rather than a wider line formation. In the battle of Crecy the crossbowmen of the French were send forward to Skirmish a little ahead of the main army and when they retreated they threw the first group of horsemen that followed them in confusion. When the French observed the English thus advance, they drew up each under his banner, with his helmet on his head: they were, at the same time, admonished by the constable, and others of the princes, to confess their sins with sincere contrition and to fight boldly against the enemy. The English loudly sounded their trumpets as they approached, and the French stooped to prevent the arrows hitting them on the visors of their helmets; thus the distance was now but small between the two armies, although the French had retired some paces. Before, however, the general attack commenced, numbers of the French were slain and severely wounded by the English bowmen. At length the English gained on them so much, and were so close, that excepting the front line, and such as had shortened their lances, the enemy could not raise their hands against them. The division under sir Clugnet de Brabant, of eight hundred men-at-arms, who were intended to break through the English archers, were reduced to seven score, who vainly attempted it. True it is, that sir William de Saveuses, who had been also ordered on this service, quitted his troop, thinking they would follow him, to attack the English, but he was shot dead from off his horse. The others had their horses so severely handled by the archers, that, smarting from pain, they galloped on the van division and threw it into the utmost confusion, breaking the line in many places. The horses were become unmanageable, so that horses and riders were tumbling on the ground, and the whole army was thrown into disorder, and forced back on some lands that had been just sown with corn. Others, from fear of death, fled; and this caused so universal a panic in the army that great part followed the example. The English took instant advantage of the disorder in the van division, and, throwing down their bows, fought lustily with swords, hatchets, mallets, and bill-hooks, slaying all before them. Thus they came to the second battalion that had been posted in the rear of the first; and the archers followed close king Henry and his men-at-arms. Duke Anthony of Brabant, who had just arrived in obedience to the summons of the king of France, threw himself with a small company (for, to make greater haste, he had pushed forward, leaving the main body of his men behind), between the wreck of the van and the second division; but he was instantly killed by the English, who kept advancing and slaying, without mercy, all that opposed them, and thus destroyed the main battalion as they had done the first. They were, from time to time, relieved by their varlets, who carried off the prisoners; for the English were so intent on victory, that they never attended to making prisoners, nor pursuing such as fled. The whole rear division being on horseback, witnessing the defeat of the two others, began to fly, excepting some of its principal chiefs. As we can see the first wave consisted of 800 men at arms on horseback followed by three battles/guards. Again each entity of the army was routed piecemeal and brought chaos and confusion unto the next in line. Another battle of the 100 years war which saw a similar setup (and resulted in the same side winning again) was the battle of Nájera in which Bertrand du Guesclin commanded the first division while the king of Castile commanded a second part a bit further back. The last battle I will name which appears to have followed a similar pattern occurred during the siege of Neuss, what follows are two eyewitness accounts of the same battle. Here the positioning of the army is described in detail. As to our news, last Tuesday 23 May the Emperor struck camp in order to approach nearer our siege, but he only passed a wood which was very near him and pitched camp on this side of the wood. As soon as we were definitely informed of his move, which was at about 10.00 a.m., we at once caused the household troops and the companies of our ordinance to take the field, leaving our said siege defended and provided with sufficient forces to resist the sallies of the people in the town and to prevent those beyond the Rhine, who were in considerable force, from crossing to this side to help and revictual those in the town. After making these dispositions for the defence of our siege we took the field and marshalled all our troops on this side of a river which was between us and the Emperor, in the following way. In the first battle [we posted] all the infantry, pikemen of our ordinance, and the English archers both of Messire Jehan Middleton’s company and of our household and guard, together with the infantry belonging to [the companies of] the lords of Fiennes, Roeux, Céquy, Haines, and Peene and other enfeoffed lords. [Among] all these pikemen were intermingled the archers in groups of four, so that there was a pikeman between every group of archers. On the right wing of these infantrymen we posted Messire Jehan Middleton’s mounted men-at-arms, as well as those of Jacques Galliot’s company, all in a single squadron, with the count of Campebasse and all his men as the reserve for this wing. On the left wing of the infantry we posted the enfeoffed lords and their men-at-arms with the count of Celane and his company, all in one squadron and, for their reserve, the two companies of Messires Anthoine and Pierre de Lignanne, also in a single squadron. We appointed our cousin, councillor, and chamberlain the count of Chimay [commander-in-]chief of this battle. In the centre of the second battle we placed the squadron of chamberlains and gentlemen of our chamber and, in reserve, the mounted guards under the command of Messire Olivier de la Marche, our maître d’hôtel, as their captain. In a squadron behind and some distance to the right of the said chamberlains and gentlemen of our chamber [we placed] all the archers of our ordinary guard and all the archers from the companies of Messire Regnier de Brochuysen, the lord of Chanteraine, George de Menton, Jehan de Longueval and Regnier de Vanperghe. The last three of these were knighted that day. On the right wing of the said archers we posted the men-at-arms of the companies of the said Messire Regnier de Brochuysen and Chanteraine with, in reserve, the men-at-arms of the companies of the said Messire George de Menton, Jehan de Longueval and Regnier de Vanperghe, all in one squadron. On the left wing of the said chamberlains and gentlemen of our chamber we posted the archers of our bodyguard and those of the companies of Philippe de Berghes, who was knighted then, and of Philippe Loycette, and on the flank of these archers all the men-at-arms of the companies of the said Messire Philippe de Berghes and Loycette in a single squadron with, as their reserve, the gentlemen of the four estates of our household, in one squadron, commanded by Messire Guillaume de St. Seigne, also our maître d’hôtel, and, under him, by the chiefs of the said four estates. This battle was commanded by the lord of Humbercourt, also our cousin, councillor, and chamberlain, as commander-in-chief in the place of our first chamberlain, [together with] the count of Joigny and the lord of Bièvres. After these battles had been organized in this way a certain amount of time elapsed, more than was necessary, because the companies did not arrive soon enough at their appointed places. Nevertheless, regardless of the time, we crossed the said river at a ford which was not too deep, firm with a good bottom and, because of the narrowness of the said ford, we made the reserve of the right wing of the first battle march across it in files, the men-at-arms with their coustilliers (light cavalry/mounted infantry) and pages on their right and likewise in file after them went the right wing and all the archers of pikemen of this wing. Then followed the archers and pikemen of the left wing and, after the wing, its reserve, and, in just the same way, the second battle crossed, the reserve of the right wing followed by the wing , the archers of the same wing, and all the rest of the second battle in similar order to the first. After the reserve of the left wing, which consisted of the gentlemen of the four estates, our guard, which constituted the reserve for the said squadron of chamberlains and gentlemen of our chamber, crossed over. Because their camp, which backed on to the Rhine, extended towards us, and we were nearest to this end of it, the enemy, thinking that we would come this way, had placed most of their artillery there. They had even trained the artillery in the encampment on the far side of the Rhine to fire in front of this end of their said camp where they thought we would attack. But, in crossing the river, we made all the above-mentioned formations advance to the left of the said camp, that is to our right, and move towards the above mentioned wood which they had passed through on the way to their camp, and we made all the formations and their reserves extend into the same order in which they had been on this side of the river. With regard to our artillery, we passed it over a bridge near the ford after the said battles, which, because they had been in order and crossed the ford as described above, were very quickly reorganized so that, when we crossed the said bridge after the artillery rather than passing through the ford after the said battles, we found they had all crossed over and were in excellent order. They were a very fine sight. It is a fact that on our arrival we moved them further towards the said wood to dodge the fire from over the Rhine and from the side where most of the [enemy] artillery was placed, as well as to gain the sun and the wind which was causing great deal of thick and stinging dust, and so that we could approach the left-hand side of the Emperor’s camp, where it was fortified, but not so well as on the other side. We gave the cry of Notre Dame! Monseigneur St. George! and our usual cry of Bourgogne! but, before we made any of our formations march, we moved up our artillery three or four bow-shots in front of us, together with the Italian infantry which had not been in any of the above-mentioned formations, so that it fired at and shot into the Emperor’s camp in such a way that no complete tents, pavilions or lodgings were left standing and people could only remain there with great difficulty. Then, in the name of God, of our Lady and of Monseigneur St. George we gave the signal for the troops to march. This done, the trumpets began to sound and everyone marched joyfully and with smiling faces, making the sign of the cross and recommending themselves to God; the English, according to their custom, making the sign of the cross on the ground and kissing it. Then they all shouted the above-mentioned cry. Because the Germans held a [certain] hillock we caused Jacques Galiot to march there. He formed the right wing of the [first] battle with the count of Campebasse as his reserve. They captured it, and the Germans were forced to flee over the flat ground between the hillock and their camp. During the capture of this hillock several of the Emperor’s people were killed. Realizing that they needed to defend and guard this flat ground to protect the security of their camp, a large number [of the enemy] sallied out both on foot and on horseback and attacked the said Jacques, who was forced to retreat towards the count, his reserve. He had gone some distance ahead of him at the first attack but now the count advanced with his reserve as Jacques fell back on him and they attacked again together and broke the enemy, putting them to flight back to the camp. Here too several of the enemy were killed. Jacques and the count had no archers with them, for the count of Chimay had marched his men too far to the left, so it was not possible at this moment to attempt anything else against the enemy and, because of the artillery fire from the camp, Jacques and the count withdrew down a valley. 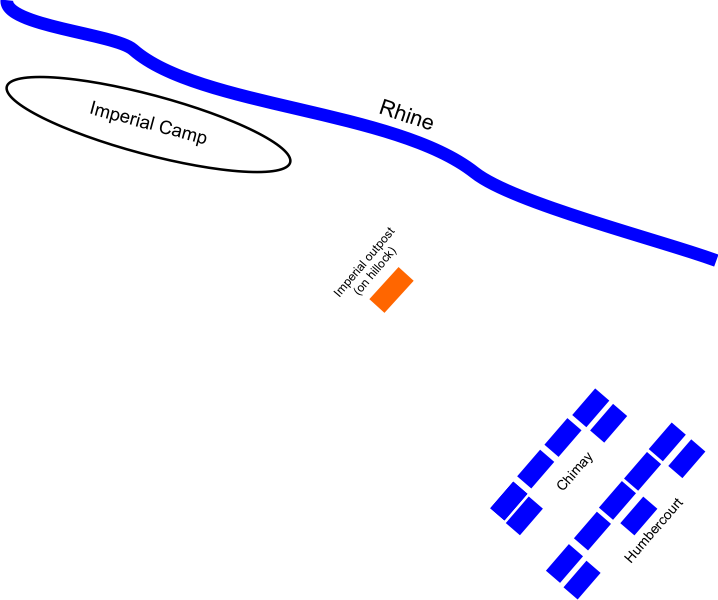 After this retreat more troops than before, both infantry and cavalry, sallied out of the Emperor’s camp to attack Jacques and the count, who let us know of this. So we had to send them the reserve of the right wing of the second battle, comprising Messires George de Menton, Jehan de Longueval and Regnier de Vanperghe and, immediately afterwards, we sent the reserve of the squadron of our chamberlains, that is, the guards under Messire Olivier de la Marche, and, because they needed archers, we ordered off the entire right wing of archers of the second battle. But the men of this wing, under the command of Messire Regnier de Brochuysen and the lord of Chanteraine, moved quicker than their archers who, because they were on foot, could not keep up with them, and these companies, of Messire Regnier, the lord of Chanteraine and our guard, united with Jacques and the count without waiting for the archers and attacked the [enemy] force which had sallied out, in which were the duke of Saxony and other princes, and drove them back into their camp but, because they did not have with them the archers of the right wing of the second battle, which we had sent them, they were forced by the artillery fire to withdraw to the above-mentioned valley. After this retreat, all the princes came out, deploying the imperial banner, which the duke of Saxony carried, accompanied by all their cavalry and a great number of infantrymen, to attack our people. They forced the right wing of the first battle and its reserve back onto the right wing of the second battle and its reserve, both wings and reserves falling back as far as our guard, which held firm. Seeing this, we took a squadron which had not yet been allocated and went with it towads the right, in order to charge the enemy. We advanced as far as our guard and the archers of the right wing of the [second] battle, in order to charge the enemy on our left, and we personally rallied and reorganized the squadrons which were dispirited and disordered. This done we attacked the said princes again, who were in considerable force of horse and foot, and they were broken and shattered. Many fled, about six or eight hundred horse towards Cologne. The rest stayed in great disorder in their camp. Our artillery continued to fire with such effect that it disrupted everything in their camp. Part of their infantry, up to two or three thousand of them, hoped to save themselves by boat, but a certain number were drowned. They threw their baggage into the boats in such a disorderly fashion that a good deal of it came floating down the Rhine, together with the dead and drowned, to the island were we had established part of our siege. It was then reported to us that the left wing and the reserves of the first battle, commanded by the count of Chimay, had beaten back the enemy in much disorder to their camp, so we decided to make all the formations advance to attack the [enemy] transport and, with this intention, we moved our artillery to where it could be most effectively used against the defenders of the said transport. But before this could be accomplished the light failed and night made it impossible for us to see everything, so that we could advance no further. By the grace of God we returned in such a way as to bring back everything safe and sound and at pur leisure, for it took us a good four hours to return to our siege. And, though their artillery fire was amazingly heavy and concentrated, nonetheless by the grace of God, our Lady and Monseigneur St. George, there were only three dead and six wounded among our people. A second account of the same battle. On 23 May the Emperor with his army came and lodged nearer this lord [duke’s] camp, half a league from it, where he was below a hillock. At once the duke was happy and full of good cheer as it is possible to say, hoping to give battle to the enemy. He gave orders to those who had to defend the camp, so that the town remained besieged and so that certain places were furnished with men-at-arms to stop the enemy sallying forth. He ordered some conductieri with their men-at-arms to advance to a plain near, or rather next to, the camp, from which there was a bridge convenient to cross over. His lordship armed himself from head to foot in my presence joking with me the whole time. Armed, he went to the church near his pavilion to pray to our glorious Lady, then straight away mounted on a fine courser, he had some sixty big artillery pieces, bombards, spingarde and spingardelle, set forward in the above-mentioned plain while organizing the squadrons, the battle and the wings. … Then he made his troops cross the bridge en masse, in all about 12,000 picked combatants turned out like St. George. Certainly I never saw people so resolved either to die or to return victorious and advancing with such spirit, as these. I was in the field during this engagement and I saw the duke applying himself in person here and there admirably in organizing and commanding. He has a mind like Caesar’s … I have never seen anyone so assured as his lordship. The [shots from] spingarde and bombards flew furiously around his horse, yet he did not care. … It required no small spirit to have left the siege and the fortified camp to go and assault the Emperor and all the power of Germany, which has not been so united for 200 years and to have returned with such a honour. Now having said all this my question boils down to this: Did these medieval generals arrange their army in a column like shape with successive lines of soldiers arranged deep rather than wide, or am I misinterpreting the text? And, provided the answer to the first question is yes, why did they arrange their army in such a manner? Was it a lack of space that left them unable to deploy their army in full width or is there some kind of tactical consideration? Posted: Thu 08 Oct, 2015 3:16 am Post subject: Re: Medieval Battles: Deep multiple battle formation? I knew many medieval commanders divided their army into separate entities such as vanguard, mainguard and rearguard, and that sometimes separate entities of the army were called 'battles'. Somewhat unhelpfully, sometimes the "battle" was the name for the middle/main element that marched between the van and the rear. Now having said all this my question boils down to this: Did these medieval generals arrange their army in a column like shape with successive lines of soldiers arranged deep rather than wide, or am I misinterpreting the text? You're referring to several different battles with several different deployment plans, so it's pretty hard to give a satisfactory general answer. But there's one important thing to remember: having the elements of the army arranged front-to-back (i.e. in a column) doesn't always mean that the individual elements were in column too! But that's not the only way to have a column. There's also the thing known (rather confusingly) in modern military parlance as the "column of lines," where there's a significant interval between the elements. Of course, the intervals don't have to be as exaggerated as in the picture below -- the most important thing is that they leave unengaged elements with enough space to manoeuvre (and defeated elements with enough space to get out of the way without disordering other elements behind them). And of course there's the "file" -- you could call it a "column of columns" too but that gets ridiculous pretty fast. And finally there's the first thing that would come to most modern commanders' minds when people talk of a military "column;" the main difference is that the lead element is fully or partially deployed to provide forward security (notice the interval between it and the second element). And those are just the simple, basic illustrations of the ideal forms. In reality these formations can be modified and combined with other forms to take account of terrain, enemy activity, and all that stuff. And, provided the answer to the first question is yes, why did they arrange their army in such a manner? Was it a lack of space that left them unable to deploy their army in full width or is there some kind of tactical consideration? Some people believe that the English at Agincourt picked a battlefield that would constrain the width of the French army's deployment so that 1) they wouldn't be able to throw their entire weight at once against the numerically inferior English force and 2) the terrain would funnel their advance into a narrow space in front of the English army, essentially forcing them to modify their existing plans and command-and-control arrangements on the fly or simply throw those arrangements into the wind; either way, it'd cause confusion within their (i.e. French) ranks. Not everybody agrees with that interpretation, of course. Now, as for why people would advance in column rather than deploying all of their elements in an extended line each and every time, there are several good reasons, but there's one way to summarise them in just one word: reserves. Imagine that every single element of your army is deployed in a single extended line with no reserves. If any part of the line breaks, you would not be able to plug it before the entire army collapses. 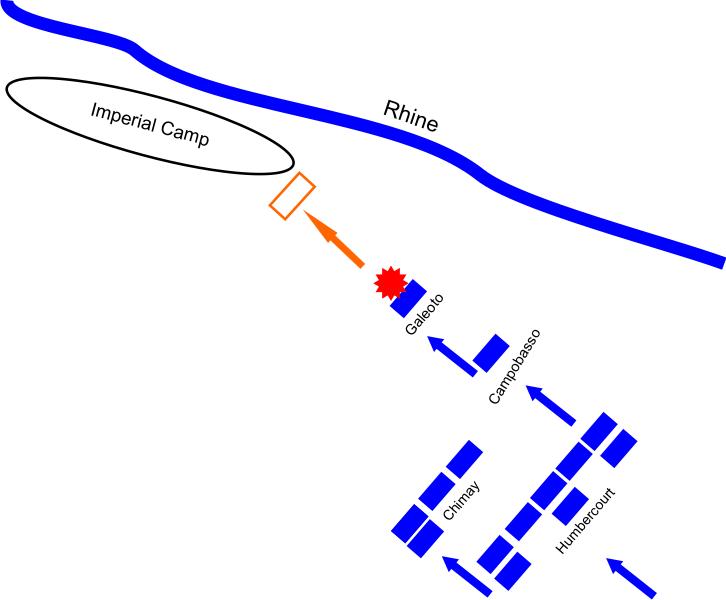 And if any part of your line wins the contest against the corresponding segment of the enemy's line, it'd have to pursue to prevent the enemy from rallying; but, without reserves, now you'd have no uncommitted troops that you can use to exploit the breach by rolling up the now-exposed flanks of the unbroken portions of the enemy's line. Of course, you could easily deal with it by keeping a small reserve behind the line. But how can you be sure that this reserve would be large enough to seal any penetrations or to effectively exploit any local victories? This is the reason why, even in the most stereotypical era of linear warfare in the 18th century, armies usually sought to deploy in two or even three entire lines rather than just one. There's no guarantee that the first blow would be enough to rout the entire enemy army, and the second (and third) line(s) would give your army the ability to sustain the assault when the first line is already reeling from exhaustion and/or combat casualties. Similarly, if the first line breaks under the enemy's attack, the second line would at least let you buy some time to arrange an orderly retreat, and in the best-case scenario it might even be able to catch the enemy by surprise when they were still tired and disorganised after fighting and then pursuing your broken first line, thus turning an initial reverse into an eventual victory. That's for the "column of lines." What of the tactical column where most of the individual elements are also arranged in a column or file? Now, the key words are flexibility and mobility. Keeping a line properly dressed takes a great deal of effort. Most commanders, modern and ancient, would try to avoid advancing long distances in an extended line if at all possible; after a short while the line would inevitably lose its dressing, developing kinks and knots everywhere, and it would be forced to halt and dress itself before it resumes the advance. That's fine and dandy if the enemy are just wax statues. But what if they have weapons that could reach out across the distance -- maybe arrows, maybe musket balls, maybe even artillery -- and they start bombarding your line while it's still trying to untangle itself from the disorder occasioned during the march? Worse, what if the enemy has a large body of mobile troops (say, cavalry or armour) that could cover the distance quickly and slam into your line before it has properly reorganised? Another problem with the line is making turns. Wheeling a short line -- maybe a platoon- or company-sized unit in compact formation -- isn't really that difficult. But when the formation gets big -- say, an entire brigade or division -- or if it is in loose order like modern infantry, then the people/units on the outermost part of the wheeling formation would have to travel a far longer distance than the ones on the inside, and it's pretty easy to end up with a huge mess in this scenario. Contrast that to the column or file. It's literally ducks in a row. Each man or element only has to follow the man/element in front of it. This makes command and control much easier -- you only need to control the head of the line, and the rest will simply follow. This is why the file is the ideal formation for travelling long distances when speed is important and enemy contact is highly unlikely. The column modifies this by deploying all or part of the lead element for forward security. This leads to a distinct form of tactical flexibility. Assuming that the enemy contact happens in front, only the lead element (the "van" in the illustrations above) -- or even only a part of it -- would have to get engaged immediately. The rest of your force would be free to manoeuvre against the enemy's flank and rear, or to break contact if it's a fight you don't really want to get into. If you have a really good and fast connection, this video has a really good explanation of basic formations in a modern context. It doesn't really take much brainpower to extrapolate their relevance to pre-modern battle tactics. Posted: Thu 08 Oct, 2015 7:31 am Post subject: Re: Medieval Battles: Deep multiple battle formation? I have some knowledge of 18th century battles, wars and soldiers and I fully realize the potential for fast movement with a column of men at battalion level. I know it's easier to move 300 redcoats in 5 files of 60 men rather than moving the whole unit forward in two or three lines/ranks of 100-150 men, terrain features or bad drill can result in a line falling apart. However I have some trouble envisioning how moving the whole army like that on the battlefield is beneficial. 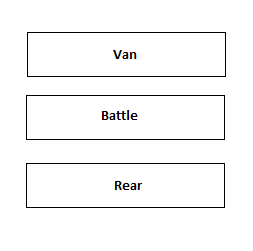 For the record, I meant the column of lines with a distance between van, main and rear. How long do you envision the distance between those elements in a typical battle? Looking at the Battle of Crecy, Agincourt and Nájera it seems like a recipe for 'defeat in detail'. Especially at Nájera where only the men-at-arms were deployed in the van and I believe only the van was engaged the whole battle. I believe Vegetius was widely read in this period yet he does not mention such an army setup. What stopped the medieval commander from employing a roman checkerboard formation or to deploy their army in a more or less continuous line with a second reserve line ready to back them up quickly? The same can asked about adopting an oblique formation and achieve local superiority in numbers. All in all it doesn't seem very wise to send a numerically inferior vanguard forward to attack first, not only have they got fewer numbers but they can be outflanked easier too (due to smaller numbers). Engaging with the van first and then immediately striking a flank of their army with your main seems like a good strategy but I don't see it being done in the above examples. I realize these medieval commanders had a better grasp on warfare of the time and certainly weren't dumb, somehow the deployment of their army in this fashion had to make sense but sadly I fail to see it. Posted: Thu 08 Oct, 2015 12:14 pm Post subject: Re: Medieval Battles: Deep multiple battle formation? For the record, I meant the column of lines with a distance between van, main and rear. How long do you envision the distance between those elements in a typical battle? It depends. The hard requirement is that the interval must be large enough to give the second line/trailing elements adequate room for manoeuvre, but small enough that the trailing element can advance to support the lead element and/or exploit its success within a reasonable timeframe. This obviously means that the distance would vary according to terrain, troop mobility, and the weapons they have. It'd obviously take an experienced commander or well-tested procedures (or both) to establish the correct interval between the lines and it's perfectly possible to get it wrong. In the account you quoted about the skirmish at Neuss, the interval between the first Burgundian battle and the second was almost certainly too short, given that the Imperials were able to rout the right wing of both battles without an apparent pause in the action. Which was the quintessential example of the column of lines! The only distinct feature of the Roman quincunx was that the units in the second line were placed behind the lateral intervals between the units of the first line -- which brings up the still-unresolved question of how the Romans filled those gaps in the front line when they were about to come into contact with the enemy. More to the point of our discussion, the Roman "checkerboard" was almost certainly not a literal checkerboard. There would have been a pretty significant interval between the first line and the second line too -- otherwise the entire infantry strength of the army (rather than just a single line) would have been disordered if a single cohort or maniple got slightly out of place. or to deploy their army in a more or less continuous line with a second reserve line ready to back them up quickly? That's the whole point of the column of lines. In fact, that is the column of lines. Well, the problem is, in some of the cases you mentioned (especially Agincourt) the vanguard sent to attack the enemy wasn't numerically inferior to the enemy's entire force! So the short answer is: the French did have a good plan that involved pinning down the English with the first battle and then enveloping the English flanks, but the proactive English movements basically pre-empted that plan and prevented it from being put into action. It also highlights the command, control, and communication problems that have plagued armies throughout history, but especially before the advent of portable two-way radios; it would have been difficult enough for the French commander to devise a new plan on the spot, but the toughest part would be communicating such an alternate plan to the unengaged second and third battles. What those battles knew was what they could see, and when the third battle saw that the first and second battles had been unexpectedly broken, it essentially chose to save its skin rather than entering the fray only to suffer the same fate. 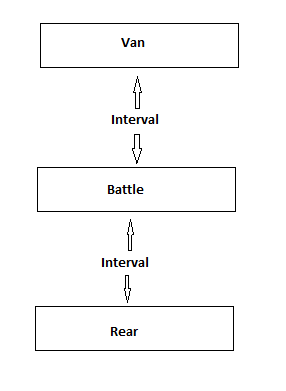 That brings up the question of what the second battle was doing; the accounts we have don't agree on enough details to really let us figure out whether the interval between it and the first battle was too small, so that it didn't have the time and space to turn to the left or right and clear a lane for the first battle to retreat when its assault failed; or too large, so that it was too late to came to the first battle's aid and was only able to launch a separate piecemeal assault after the first battle had been broken. It didn't always fail. Look at the Swiss for column formations that worked. At Sempach, their van fought alone for a while and was broken, but held out long enough to exhaust and disorganise the Habsburg forces. So when the main battle and the rear arrived on the battlefield, they found a tired and disordered enemy that they then proceeded to steamroll. 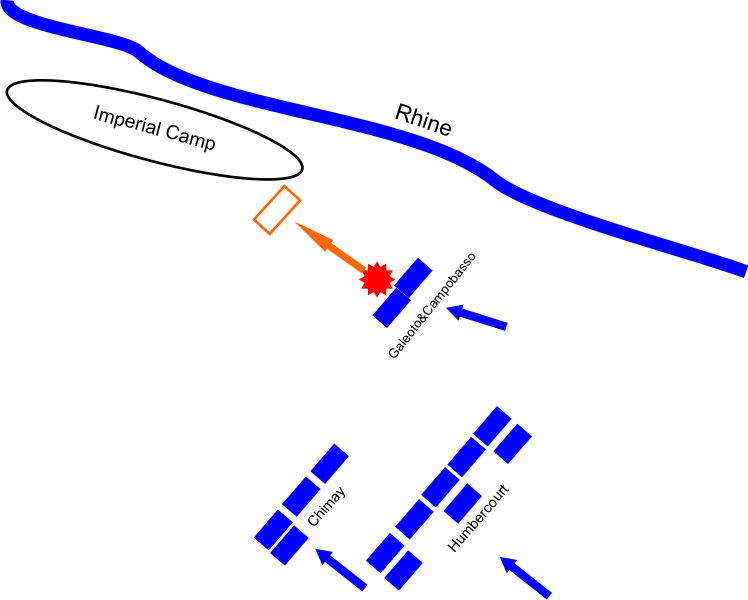 In this case, the interval between the lead Swiss element and the main body was too large to allow the latter to come to the former's aid, but apparently large enough to let the broken vanguard get out of the way before the main body barrelled down upon the Habsburg forces. In later warfare, deploying only the vanguard to hold off the enemy force was (and still is) pretty much the orthodox way of starting a meeting engagement. It's not really important that the vanguard be as strong as the entire enemy force; it just has to be strong enough to occupy the enemy's attention until the trailing elements could manoeuvre to hit the enemy in the flanks. Of course, this means that figuring out a proper size and composition for the vanguard is an art in itself, and the vanguard itself must not think and act passively; by pressing the attack, it keeps the enemy off balance and retains the initiative, which should help offset its numerical disadvantage compared to the enemy's entire force. Unfortunately not all vanguard commanders are skilled and aggressive enough to pull this off, and at the same time not all enemies are lethargic enough to just sit still while our forces are manoeuvring against them. In short, deploying in a good formation and having a plan to take advantage of it is one thing. Executing it is a different thing entirely, especially in the face of an enemy who could also plan and act aggressively. Another thing I probably need to clarify is that the illustration of the Burgundian formation at Neuss almost certainly exaggerated the depth of both the individual elements on the ground and the army on the whole. If we had been looking at the actual army deployed on the ground, it'd probably be obvious that each Burgundian battle deployed in far greater width than depth, and in all likelihood the entire army was still wider than it was deep even when we take account of the interval between the first and second battles. But it's still a "column of lines." 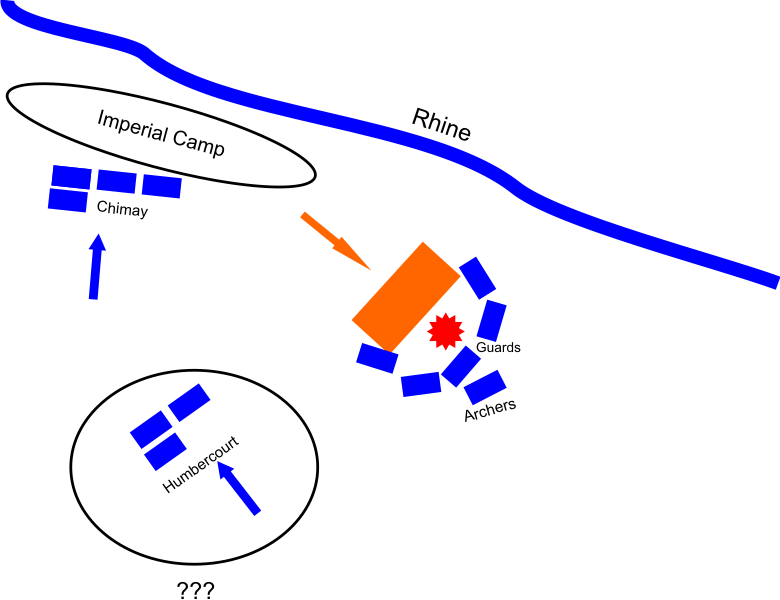 Having reread the account of the skirmish at Neuss (I don't think it's such a major battle since it didn't really receive a hugely prominent mention in most contemporary sources), I decided to draw a series of maps to show my simplified interpretation/understanding of what happened throughout the fight. We start with the initial deployment, where the Burgundian army had crossed the river and redeployed off towards the left flank of the Imperial camp rather than straight to its front. Then the initial movement, with the two squadrons of cavalry from the right wing of the first battle peeling off to seize dominating terrain (a hillock) on the right and Galeoto's lead squadron driving off the small Imperial force posted there. A fresh force sallies out from the Imperial camp and beats Galeoto back. Galeoto then links up with his reserve/trailing squadron under Campobasso and their united force drives the Imperials back. The engagement continues to snowball; the Imperials send out an even larger force, while Galeoto and Campobasso are reinforced by forces from the second battle since the first battle had moved too far to the left to send aid in time. 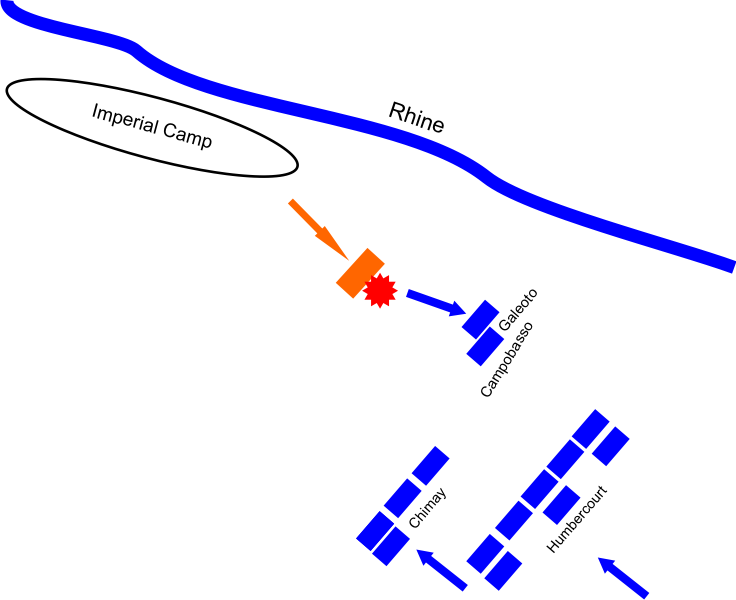 Having beaten back the Imperials for the third time but unable to press on since the archers on foot were still lagging behind, the right-wing force decides to regroup and reorganise into three lines partially corresponding to their original organisation: Galeoto and Campobasso from the first battle in the first line, the reinforcement squadrons from the second battle (except the guards) in the second line, and the guards and the infantry archers in the third. Note that the depth of the lines (and the size of the forces) in this right-wing engagement are probably hugely exaggerated relative to the actual space these forces would have occupied on the ground. 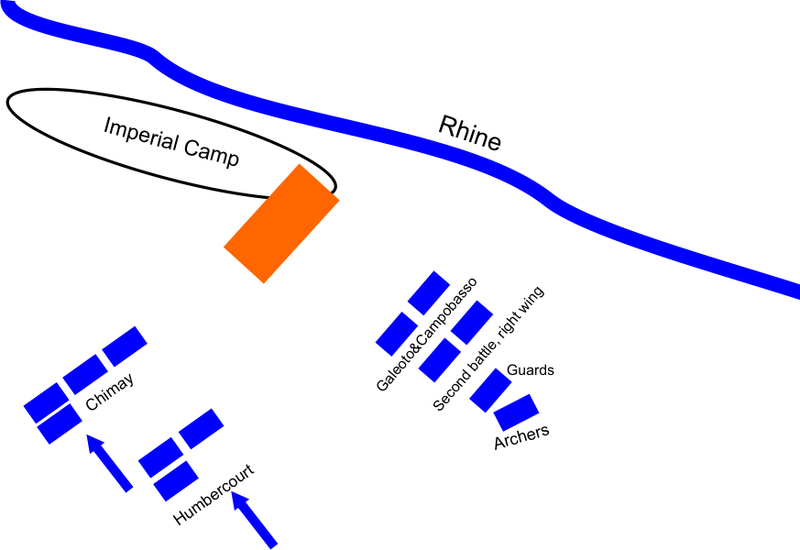 This is probably the only moment in the battle where your question about the "column of lines" really applies; we don't know why the reorganised force decided to deploy itself in this particular manner, but I think it must have had something to do with wanting to utilise the command and deployment arrangements already devised for the army (i.e. the first battle leading, second battle trailing) rather than having to devise a completely new command and deployment plan on the spot. Now comes the climatic moment, where an Imperial force larger than the previous ones breaks through the first and the second battles but is successfully stopped by the squadron of guards acting as a last reserve. Here the Duke of Burgundy leads an uncommitted squadron around the Burgundian right to strike the Imperial left flank, but there is no clear indication of which component this squadron came from so I've decided not to depict it. 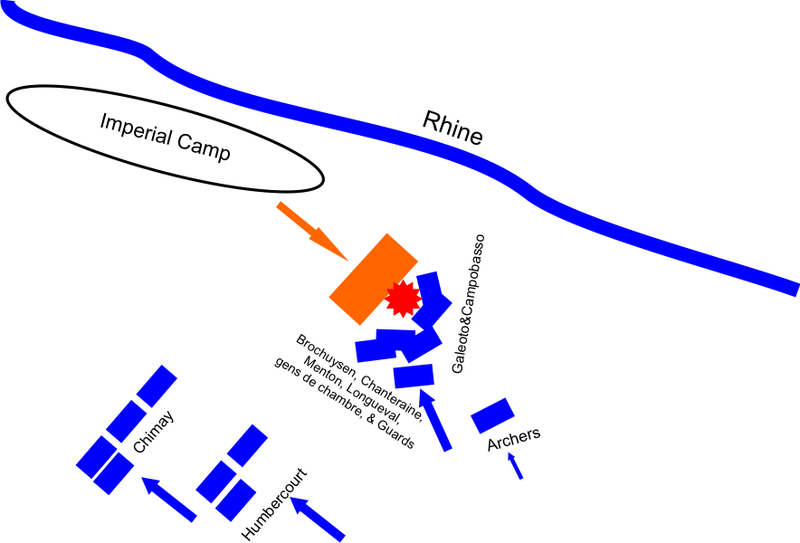 Note that I had moved Chimay's and Humbercourt's forces -- the main bodies of the first and second battles, respectively -- in an incremental fashion under the assumption that Chimay's first battle must eventually reach the Imperial camp somehow by the time the cavalry skirmish on the right was building up to its climax. There was no further information about the components of Humbercourt's force (the second battle) that didn't join the fighting on the right, so again I've decided not to place them in any definite location on the map for this last phase. On the whole, the engagement looks like a classic cavalry fight with its see-saw dynamics -- something we see on a much larger scale in the Western Desert campaign of WW2. Thanks for the illustration that clears things up quite a bit. In my mind the army was actually deployed way deeper which would indeed be a bit odd. I had hoped to reply a bit earlier but promptly forgot about it. thus the distance was now but small between the two armies, although the French had retired some paces. which might the vanguard went back further than the main line. At length the English gained on them so much, and were so close, that excepting the front line, and such as had shortened their lances, the enemy could not raise their hands against them. Which also suggest it was a relatively messy affair. What I also find striking is that he talks about lances and not pollaxes. In fact quite a number of battles being depicted show dismounted man-at-arms fighting with lances rather than pollaxes, though this is diverging from the original topic. The others had their horses so severely handled by the archers, that, smarting from pain, they galloped on the van division and threw it into the utmost confusion, breaking the line in many places. and the whole army was thrown into disorder, and forced back on some lands that had been just sown with corn. Others, from fear of death, fled; and this caused so universal a panic in the army that great part followed the example. Duke Anthony of Brabant, who had just arrived in obedience to the summons of the king of France, threw himself with a small company (for, to make greater haste, he had pushed forward, leaving the main body of his men behind), between the wreck of the van and the second division; but he was instantly killed by the English, who kept advancing and slaying, without mercy, all that opposed them, and thus destroyed the main battalion as they had done the first. Perhaps the second line was also disrupted by fleeing troops, maddened horses and compressed so badly the men could hardly fight, but this is just conjecture. There are two other battles in which the Vanguard seems to have engaged a numerical larger force such as the Battle of Stoke field and the Battle of Nájera. The picture has no source so I have no way of knowing what good it is. aback on the left hand of the first, battle. their currours that they should shortly meet. clearly their enemies coming toward them. apparelled himself ready to fight. noble armoury ^ that was there. the earth, that never after was relieved. why, and a two thousand spears with him. score thousand men afoot and a-horseback. other knights of France and of Aragon. was done many a noble feat of arms. mant of Saint -Venant and divers other. their lord and king had not been. greatly to the Englishmen's profit. A nice description of how individual combat could appear in the press of two lines is located somewhere in there. I cannot validate the numbers of combatants involved but they seems a little high to me. As for your drawings which are quite nicely made: Did you include the initial infantry engagement? Are these infantry under the command of Chimay? At about 20.00 hours the duke’s artillery and large spingarde began to fire among the enemy and they replied in terrible fashion so that it seemed like hell, and as if the world would be destroyed by thunder and fire. Then they attacked the leading squadrons with some infantry composed of hand-gunners but these were driven back and numbers of them were killed by our infantry. Najera is always a pretty tough nut to crack. But in any case virtually all interpretations I've seen of the battle sees the advance of the French vanguard as the start of a multi-phased attack plan, which (once again) was foiled by proactive English movements. What's clear from all the sources is that Bertrand du Guesclin's vanguards kept on fighting for very long time, remaining unbroken despite heavy pressure. This was exactly what a heavily-armed but outnumbered vanguard should do, and the plan failed not because the vanguard failed but because the rest of the army didn't really pull their weight in the engagement (or were prevented from doing so). Indeed, David Nicolle's interpretation in his Osprey book on late medieval warfare interprets it as having the French vanguard be the first heavy unit to enter the fray and the very last one the break. No, since I don't see it as a separate part of the engagement. It was probably just part of one of the initial back-and-forth exchanges between Galeoto's detachment and the Imperial outpost/advance forces. After all, nowhere it is said that Galeoto's force was exclusively made up of cavalry -- or that the initial German infantry advance was "driven back" by the infantry, only that "numbers of them were killed by our infantry." And the next sentence mentioned a joint assault by both Galeoto and Campobasso, which hints that the first encounter was the one handled by Galeoto and his forces before he linked up with Campobasso.